We are officially one step closer to making everything in our home smart. 3M recently announced their new Filtrete Smart Air Filter. It can monitor the quality of your air filter and remind you to replace it. But is a smart air filter really necessary? Let’s explore this in our Filtrete smart air filter review. Affiliate Disclosure: This page contains affiliate links, which earn us commission at no cost to you. The writers of this blog received a free sample for review. They were not compensated in any other way. The opinions are 100% their own and not influenced. The Filtrete Smart Air Filter has a Bluetooth pressure sensor that monitors the airflow of your heating and cooling system. You can easily see how much life is left in your filter within the app. Once the filter is worn out, you’ll be notified that it’s time to replace your filter. This is based on the life left in your filter, not how long it’s been installed. This is the main selling feature of the Smart Air Filter: since everyone’s environment and home is unique, some filters needs to be replaced earlier than the recommended quarterly schedule by the EPA, especially if there are pets, smoke, nearby construction, or other contributing factors. By adding the companion app to track when and how you should replace your air filter, it takes the guesswork out of replacing your filter. Once you get a notification that it needs to be replaced, the used filter has to be thrown out, including the Bluetooth sensor. It’s a bummer you can’t reset the sensor and use it on another air filter, but you can easily purchase a new filter within the app when the time comes. Tips for improving air quality. This section includes ideas about ventilation, information about outdoor air quality, and more. Filter size and info. Quick: what’s your filter size? When was it installed? While it’s usually difficult to remember and track these details, it’s very easy in the Filterete app where it’s readily available. Replace your filter within the app. As you could probably guess, Filtrete also makes it simple to replace your HVAC filters using their convenient Products section of their app. The other option is to click on Buy Replacement when the filter information is loaded up. Easily Pair a new filter. Once your new filter arrives, just click Pair Replacement on the filter page to begin setting up your new filter. In testing for our Filtrete Smart Air Filter review, we found that the app was helpful and very easy to use. It takes the guesswork out of replacing your air filter, and provides some peace of mind about the air I’m breathing. 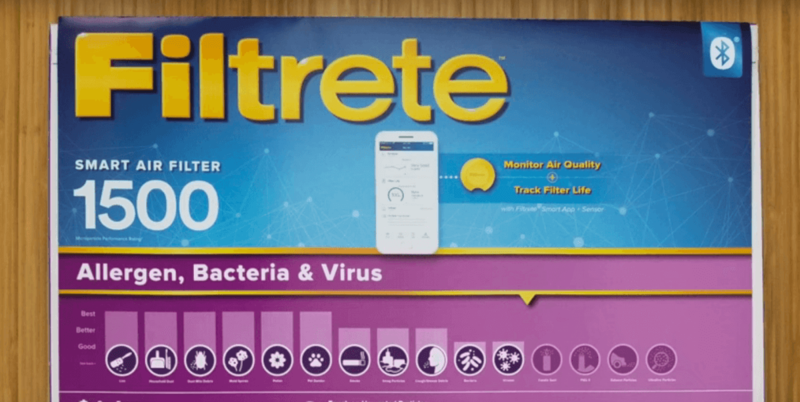 Filtrete’s Smart Air Filter will be available in March in a wide range of sizes. The price will sit somewhere between $21.99 to $29.99, depending on the size. The filters will also be compatible with some indoor air quality monitors, although no word yet on exactly which ones. All of this comes down to the question: do you even need a smart air filter? While 3M’s app has helpful features, some people might not find it necessary if they already have reminders set for changing their air filter periodically. Don’t buy it if: you religiously change your air filter, memorized its size, and know that your home’s air quality is great thanks to your diligence. Buy it if: you’re the type of person that notoriously forgets to change your air filter. You probably also forget the filter size, get annoyed at re-ordering it, and want to streamline the process altogether. Failing to change your air filter on time is potentially damaging to both your health and the functionality of your HVAC system, so if you want to make it easier on yourself, then Filtrete has the answer you’re looking for. You will also want to strongly consider it if members of your home suffer from allergies, or if there are pets, smoke, dust, construction, or other environmental factors near your home. What do you think? Is a smart HVAC filter: or ? Let us know in the comments below!